Describe what you do: I have 3 brand new ventures I am about to launch. I can’t wait for you all to see! I’m still hosting a couple television shows and speaking regularly. Biggest mistake you made in your previous season: I can’t even see a mistake in our first seasons. In the end we lost in a bad taxi..so I guess getting in that taxi? Yes. Most memorable moment from your first Race: Sleeping on the ground in India, with my dad, between the cowboys and the globetrotters..a moment I never would have expected to be in, but one of the best for sure. They’re still two of our all-time best race friends and real friends to this day. Favorite place you visited on your first season: I liked Zermatt, Switzerland and India on the next one. Why do you want to run the Race again? I know I will win it one way or another. And as I am in the beginning of a lot of really exciting ventures, I would love to have the prize. How have you changed since the last time you competed? My first two seasons I had just come off of Miss Kentucky and Miss America, they were kind of my identity then. After finishing my reign and then doing two seasons of race back to back at first I didn’t know how I could ‘top’ that. That’s when I really changed my mind and started a whole new journey full of real life adventures. What are you passionate about? My Family, My Faith, My Hometown, meeting sweet loyal fans, Food(sorry Mom) but for real, speaking to Children, building new businesses, travel(still), and singing…oh, and dancing. People would be surprised to learn: That I was Valedictorian, that I’ve never tried a food I didn’t like, that I grew up on a farm with 24 first cousins(I was the oldest). Biggest challenge you and your teammate will face on The Race together: If it were my dad I would never fear a thing…ever. He taught me that and he set an example for me that nothing was ever about the money. When you focus on that you lose a lot. My new teammate I will face a lot of challenges. It will be mostly challenges. We don’t know each other that well. I don’t know how he races or if our styles match, so the challenge will be learning that as we race. Pet peeve about your teammate: My dad, that his back is hurt and he can’t run this race with me right now. My new partner...I could say a lot, but I guess the main thing is that he’s not really the person I expected him to be from watching his first season. But I wish him the best. What country and place would you most like to visit and why? Rome: Pope Francis…Greece: I’ve still never been. What do you hope to accomplish by running The Race (other than winning one million bucks)? I hope to prove that I can do a lot of great things on my own, that I can set a good example again, and that I can help someone else win a million dollars. Any strategic changes you will make heading into this Race: I may have to play all the roles since I don’t really know what my partner does. I need to learn how to navigate for sure, and I need to learn to level myself out when I get too excited. My dad used to do that for me, but if he’s not with me I have to make these changes in order to stay in the race. Oh and always pack lighter. Most memorable moment from your first Race: Riding the train through the Swiss Alps. Why do you want to run the Race again? Win one million dollars. How have you changed since the last time you competed? I haven’t, just got a little older. What are you passionate about? Helping people, making sure kids have a future and making a difference. People would be surprised to learn: Everyone already knows everything about me. Pet peeve about your teammate: He’s hard headed. What country and place would you most like to visit and why? I’d like to visit Australia because I’m an outdoors guy and would love to see kangaroos. What do you hope to accomplish by running The Race (other than winning one million bucks)? Getting my county recognized since we need all the help we can get. Any strategic changes you will make heading into this Race: Learn how to navigate. *Due to Medical Reasons, Bopper was unable to start the Race and Mallory took his place. Biggest mistake you made in your previous season: Didn’t take the time to read the clue correctly. Most memorable moment from your first Race: Going through Africa and taking the plane ride over an active volcano. Why do you want to run the Race again? To win some money so I can relocate my family to a clean and healthier place to live because my daughter is sick. How have you changed since the last time you competed? I’m just a little older and a little wiser but I’m still the same. What are you passionate about? My family is my biggest passion; the love that I have for my family and taking care of my father. People would be surprised to learn: I would give a total stranger the shirt off my back. Biggest challenge you and your teammate will face on The Race together: Getting along better between the both of us and focusing better than the first time. Pet peeve about your teammate: He thinks that he knows it all and will not listen and reason with me. What country and place would you most like to visit and why? I’d love to go back to Africa because I would love to have a chance to really experience the culture. What do you hope to accomplish by running The Race (other than winning one million bucks)? To better the life of my family and draw a little bit of attention to Clay County, the third poorest county in the nation. Not sure if I should be posting this or not, but here's their elimination interview Podcast with Rob Cesternino from his website. 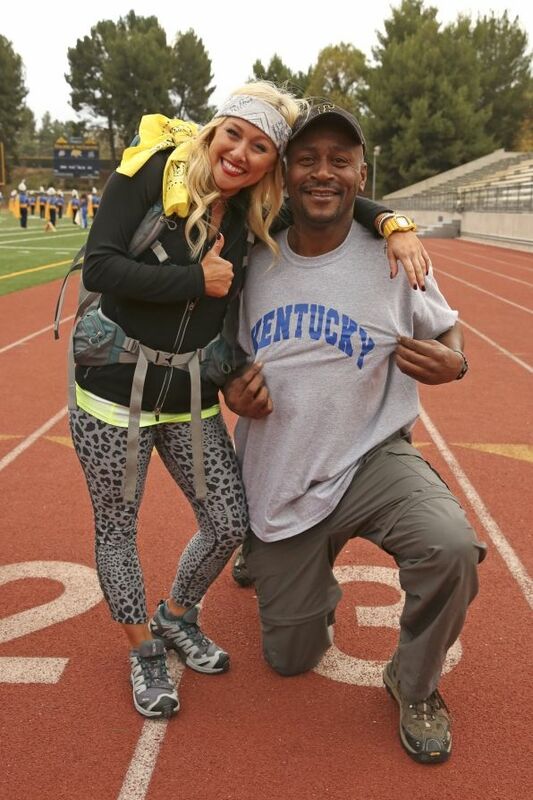 The new — but not necessarily improved — Team Kentucky didn't last long on The Amazing Race All-Stars. After Mallory replaced Bopper to race with Mark, the hybrid duo became the second team eliminated on Sunday after they forgot Mark's backpack at the Roadblock and debated whether or not to go back and get it. "I think we were at a disadvantage from the beginning with communication," Mallory tells TVGuide.com. "We didn't know each other well and we didn't talk about anything about the Race since I came in so late." See what else the two had to say about their last-minute pairing, how the Detour also set the back and if they'd ever race together again. Did Bopper know what happened? Mark: No. He had no idea. Bopper watched it at his house with his family. He called me as soon as the episode was over. It was tough. You had some miscommunication at the Roadblock. Mark, you asked if Mallory had your backpack, but she replied about something else. What happened there? Mallory: I think we were at a disadvantage from the beginning with communication. We didn't know each other well and we didn't talk about anything about the Race since I came in so late. My dad and I would know what to do in that situation had that happened, whoever did it, but Mark and I didn't have any time before to plan. We hadn't discussed anything. That's why I think it blew up so badly. There was so much going on. I was getting the taxi and Mark was putting the toy car in the back. He thought the bag was there. I'll take the blame for it. Mark: We're not going to put the blame on anybody. It was just something that happened. Like Mallory said, we didn't get to talk to each other. When I asked her if she had it and she said yeah, the backpack never entered my mind again because I thought she had it until she asked me where it was. That's when we realized we left it. I have to say "we" because we both left it. I should've started thinking about the backpack when I got into the cab. It was both of our faults. I didn't want to leave the backpack. It belonged to a friend of mine. I borrowed it and I was going to return it. It might have cost me $1 million to return it, but it was just a big mistake on my part. It was made worse by the fact that Mallory had your passport and your meds, so you could've continued. If she didn't, there wouldn't be a question of whether or not you should go back. Mallory: Right. That's what broke my heart. I would never say, "Mark, no, we're staying. We have to continue." Our communication was bad, but I was still part of the team. I just wanted to make sure Mark understood that I had the passports, I had his medication. But I think we were both so flustered. Mark: It wasn't just the medicine and the passport. I didn't have my glasses or my contacts or clothes. And I get cold! I need my clothes. There's no way I could've gone on without my glasses. My contacts were only going to last another day or two before I would've had to switch them out. I would've been basically blind. ... My backpack was my lifeline. Mallory: And I understand the contacts, but we were already talking about buying a pair of glasses. And I'm there thinking, "Look at all these teams and their support for us." I knew Flight Time and Big Easy, and the cowboys would be the first ones to step up and hand over their clothes. I knew how much they cared about him and his story. I wasn't thinking that Mark was going to have to go around the world for 23 days in that outfit. I would've frozen in Switzerland and left my backpack, but you know, we're different. Like I said, my dad and I had that discussion, and Mark and I didn't. But I knew everyone would've supported us through the rest of the Race. You could tell at the finish. Everyone was crestfallen. Mallory: Yeah, that was sad with everyone there. They didn't show a lot of it. A lot of people took a taxi to the finish, but we ran. We were like, "This can't be the end. Maybe it's a 'keep racing' leg." Then we came around the corner and saw all the teams lined up. It was really sad. It was good to have support because neither of us had our support there. You still caught up with everyone at the Detour. Mark: Yeah, but now that I've seen the show, we should've done the other one! We both needed that massage on our backs! [Laughs] But we did the [shuttlecock] and that was a lot harder than we thought it'd be. It's hard to kick that little thing. We were there before two other teams showed up, but we could not get it down. Maybe if we had done the other one, we'd still be in it. Mallory: But we were flustered after everything that had happened. Not to blame it on anyone, but we picked a bad team to play with. Watching it, you can see all the other players tell team s when it went out of bounds. Our players, I don't know if they were tired at the end, but it was hard. Mark: When they got tired and they didn't care if they got in or not. When the other teams showed up, we started to panic, but they were in that "don't care" mode. But as soon as we got another team, we got it. So it was just bad luck. When did they call you to replace Bopper, Mallory? Mallory: It was a few days before the Race started, but it wasn't definite because he didn't withdraw until the night before. I kept thinking, "Am I the Biggest Loser or something? Am I on Survivor?" I really had no idea what was going on. They didn't send him out there thinking he couldn't race. Mark: The day before we took off, they took more blood and he didn't get any better. I didn't want to do the Race at all, but I knew Bopper needed it just as bad as I did. He kept telling me to do it, so I said I'll do it for him. And I wanted to do it for our little town, Clay County, and I knew Mallory was a real go-getter. I didn't know a whole lot about her. I just saw her and her daddy run it. I just knew she was a little fireball. Mallory: Just a little too much fire this time! But you two hadn't met until the starting line, right? Mallory: Yeah. We've met before, but not as a team to run the Race! And then not even 10 minutes later, the Race started. And everyone was crying and was upset. It was hard to come into that with vigor like, "Oh, here we go! I'm going to win this!" Mark was already in such a bad spot. He was leaving his friend. It's just hard all the way around. My dad was so supportive of it. He said, "Yeah, you go out there and help him." Mark: I felt like I had a lot of pressure. I had more to prove this time because I was going to let my county down and my best friend down if I didn't do good. She didn't know me and I didn't know her. ... It's hard to run the Race with someone you don't know the ins and outs about. People don't realize when Mallory and I got to the Pit Stop, it wasn't like we sat down and talked. She went to her room and I went to my room to sleep and we weren't around each other until we had to start the next leg. Mallory: I had a ton of pressure on me too. I almost won the last All-Stars. I was terrified that I would do awful. ... I wanted to do well because I didn't want everyone to think, "Oh, it's just her dad!" I'm very loyal to my state, my county, and I love the Race. I would run the Race 10 more times. All the pressure of having to worry about the money and I wanted to win for Bopper — I was going to give some to Bopper too. I just wanted to do well. I couldn't have it in the back of my mind that I was going to lose it for them. They should give you another shot with Bopper and your dad. Mark: I don't think I would ever run the Race again without Bopper. No offense, Mallory! There's no way I would do it again without him. Mallory's a great person, but I would never do it again without Bopper. I would love to run it with Mallory and her dad on the same season. Mallory: That would be fun. As long as we've got our partners! Mark and Mallory answer YOUR questions about their experience on The Amazing Race. Do they plan to stay in touch? How is Bopper doing? Find out here! Kevin K: My question is for Mark: how is your buddy Bopper doing, is he getting better? Mark: Bopper is doing great. He's ready for another chance if we can get it. Darlene S: Mallory, did you really have his passport and meds? Why were those not in the bag? Mallory: Hi Darlene, I did. That was something I always did with my dad and I because we always knew we would leave a backpack if needed and race with only the essentials. It was a tough thing for me to learn that we couldn't race without the bag, but I was always on Mark's team so if he needed it that badly I had to understand. It was a disadvantage racing without knowing things like that for sure about how we would run our race. We were just on different pages about it, but yes I had them. Lois I: Do you think that if you worked to connect and form a partnership that you would have been one team instead of two individuals? Mark: Yes, I think if we took the time to talk it would have been a lot better. But that didn't work and my opinion didn't matter. We have two different personalities. I show respect to everyone and don't look down on nobody. Nikki H: Question to Mark - It seems like a supportive bunch this year. Even though the loss is devastating, how did it feel to have the rest of the "all-stars" cheering for you? Mark: It was great to see all of them there. But it was very sad that I let my county down and Bopper so it was bittersweet. Anders S: Do you regret going back to get Mark's bag? Mallory: Hey Anders, I was against it from the start, but I was part of a team. If he thought he needed it that badly I couldn't really do much more than that to convince him. It's the disadvantage of not knowing how you will race together. We just didn't have the luxury of figuring those things out before. Carol L: How much time did you lose going back for the bag? Mark: We lost 45 min going back. But 30 min of it was Mallory trying to find a taxi to go get it and meet us at the next stop. If we just go get it after we dropped the car off it would have been around 15 min. We go from 1st to 5th or 6th. But it all happened for a reason. Everything does. Mallory: Hey Carol...I would estimate about an hour...an hour and a half maybe. It seemed like an eternity. Mary M: Do Mark and Mallory plan to remain in touch? Mark: If she wants to...the race is over and life goes on. Nobody can have too many friends. Mallory: Hi Mary, We are friends, but we haven't spoken a ton since the race. You get so much time together on race that you can take a few weeks from speaking and they feel like no time at all. From this whole interview, especially with the last question, it's clear to see that Mark & Mallory still aren't happy with each other. In fact I don't even think they were together when they were answering these questions, especially with the answer Mark gives for the third question.